Find inner peace by creating a harmonious atmosphere for your mind and body. Make your own home a place to escape from daily stress, by adding a few essentials to your bathroom. Let it become your daily center of relaxation and fill it with colors and fragrances that make you feel like royalty. The contrast between shapes, colors and materials give a room character. Create peace for all of your senses by ensuring your décor blends together as one. Keep your bathroom as natural as possible using a combination of white and the colors of nature. Complement the look with wooden benches, shelves and sinks. 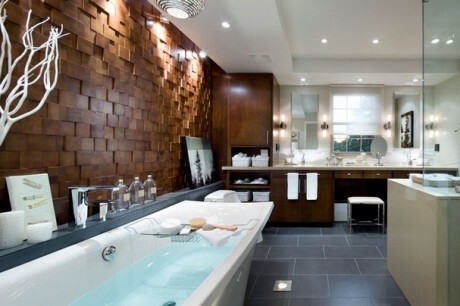 Your day begins and ends in your bathroom, so make sure you have adjustable lighting for different times of the day. Let your bath be the center of attention and adorn it with scented candles and aromatic oils in clear jars. Stick to a consistent style to your bathroom furniture and choose matching décor. Take a minimalistic approach inspired by the East. Decorate with soft neutral colors and bold accents and add color to your candles and place them all around your bathroom. Roll up some bath towels and store them in a wicker basket, proudly on display. To add a nice touch, wrap them up with ribbon. Don’t forget to add a little greenery. A few pots and plants will go a long way and will provide you with little more visual stimuli. Luxurious thinking is key. Remove anything that doesn’t serve a practical purpose, and use décor that is meant for indulgence – towel warmers, soft cotton mats, automatic air fresheners, etc. Remove all of your clutter and half-empty bottles. Hide shampoo and conditioner containers in a cupboard near your shower, or buy a bunch of matching clear bottles to aid continuity. Josefine Andreasson is a home décor enthusiast and blogger from Sweden. She is currently in the process of opening her own décor consultancy service in London and will specialize in Eastern design. ← What a new fence can do for your garden.